I will be starting a series of articles on facial enhancement, facial contouring, and PPP, pimples, pores and pigmentation. Today, we will discuss facial enhancement, and the topic of today is the Asian nose. I shall share my experience and give a balanced an unbiased view comparing HIKO Nose Threadlift, Nose fillers and Rhinoplasty. What is HIKO | HIKO NOSE LIFT? HIKO is an elegant technique , founded in Seoul. There are many versions of HIKO, and various threadlift companies have their own version. Here is the science behind it. Fine threads called polydioxanone (PDO are inserted into the nose to enhance your bridge, body and tip. Fibroblasts are stimulated to produce new collagen, which produces a volumizing and lifting effect. Below are the various sizes of a HIKO nose lift thread. What is the difference between HIKO and nose fillers? Nose fillers carry the risk of blindness and skin necrosis. They can be used to enhance your nose bridge, tip and body, especially if you have a flat nose. Non surgically, with minimal pain, downtime and bruising. Results are instant. Nose fillers can be used to correct a flat nose bridge, a down pointing nose tip, and a dorsal hump, all common in Asians. However, it cannot be used to make a nose smaller. To do so visually, there are options. In the grand scheme of things, it is important for the nose to harmonise with the rest of your facial features. Keeping things natural, simple and beautiful. HIKO is akin to a marriage between traditional dermal fillers and surgical implants. Results are more natural than fillers. Compared with fillers, HIKO has better longevity, does not spread out to broaden the nose (which can happen with fillers), and produces a contoured and sharper nose tip with defined bridge. Compared to surgery with implants, it has relatively no downtime, reduced pain, swelling and bruising. WHATS THE DIFFERENCE BETWEEN PDO THREADLIFT AND SILHOUETTE THREADLIFT? So is it better to do a Rhinoplasty, Nose Filler or HIKO Nose Threadlift? This depends very much on your desired outcome and existing nose profile. Some people require nose fillers, some require nose threads, while others require both for the best results. For general nose contouring in a straight nose, threadlift is the choice. For noses with volume deficits for example a dorsal hump, fillers are required. For an obvious and 3D look, combination of threadlift and filler gives the best results. For a long term results, go for surgical rhinoplasty, though there is downtime. Why do I have no or minimal results post nose threadlift? Nose Threads used were the incorrect quality, commonly too thin, lacking cogs, not firm enough etc, hence creating a firming but minimal lifting effect. Nose Threads quantity was not enough or technique of placement of Nose Threads was not optimum. Need for Nose fillers to augment certain areas on your nose. Bottomline: Not all threads are equal. The quality of threads used is important. 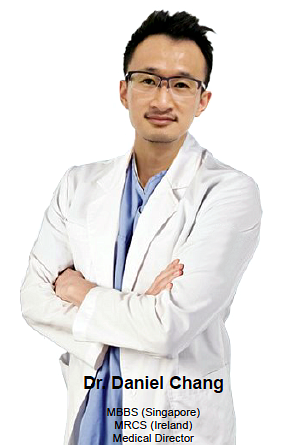 Can men undergo HIKO Nose Threadlift? Nose Threadlift is commonly used for nose augmentation in men these days. As males tend to have larger noses with dorsal humps, fillers may be required, and more threads too , compared to an average female. How many sessions do most people need to achieve a good result? For most patients, one session is required. For the minority who desire very obvious results, top ups may be needed. For optimum, a second session at 6 to 12 months helps lock in the lifting effect. Injection marks which will heal with proper care. Risk of infection, hence it is important to do the procedure in a medical clinic under sterile technique. *Please note: As this is a medical procedure, results may vary from individual to individual. Hence it is best to seek a consultation with your physician to understand the treatment further. Above are example of nose augmentation, done to correct the sunken nose bridge and raise the nose tip, common issues in Asians. And here, we have one of the most beautiful Asian woman. See if you can guess who she is! What is the cost of nose thread lift? This varies and depends on the experience of your surgeon. For experienced surgeons, prices start from $900. Would you know of a doctor that performs this in Sydney, Australia? Hi Jenny. Unfortunately, I do not know of anyone personally. am i allowed to smoke after hiko threading? As smoking interferes with healing, it is best to refrain from smoking in order to speed up the healing process, so you can see changes you really like. Hope this helps! Thank yo Dr. Chang for answering my inquiry. But rest assured it wont affect the result right? and last question, am i allowed to drink? even small amount of alcohol? thanks again! What is the best (brand) thread? Previous Believe. Dream. Achieve. Gratitude.